Texas Timber Frames in San Antonio is traveling region-wide offering continuing education classes on behalf of the Timber Frame Business Council. In addition to presenter Jack Dickinson, the General Manager of the company, additional representatives within the company are joining in the effort to reach architects to inform them of the beauty, sustainability, and tradition behind the timber frame building system. The class is accredited by the AIA and is being offered to firms at their offices or convenient locations and lunch is provided upon request. Opportunities are in place to sign up for the AIA Austin Chapter Summer Conference presentation on Thursday, June 14th at 4:00 or at a presentation being given the week before at House + Earth in Austin on Thursday, June 7th at 3:30--food and wine will be served. In-house presentations at your place of business are also available. Contact jdickinson@texastimberframes.com for more information. The class covers the unique history of timber framing, an essential building tradition that spans hundreds of years and multiple continents. It also covers the benefits of the energy efficiency, quality of material and construction, and sustainability of the craft. The presentation draws upon the knowledge Texas Timber Frames has acquired through 25 years as an industry leader. perfect layout and design will be found. One hopes in this case to get a great plan for one low price. plan, however small—can be a huge headache. personalize and perfect their design. are entirely capable of making these changes at a very reasonable cost. and frame engineering, executing on what we do best. call and we can discover the best way for you! In the summer of 2010 Texas Timber Frames and Lumber Link decided to work together in becoming the best specialty timber providers in South and Central Texas. For years, both companies looked at the same building plans and bid against one another. They were both attempting to provide the timber and any timber fabrication that came to their attention. However, in looking at what each company truly specialized in, it became obvious that working together would, in the end, be far better for each company than going it alone. Texas Timber Frames procures timbers directly from the mill and orders only the highest grade materials available in any timber species. These timbers are ordered once a job is landed; they are not stocked in our facility to avoid shrinkage and checking of timbers over time. In addition, our mechanized fabrication process of unique mortise and tenon joinery add a level of quality and craftsmanship that is unmatched in our region at a surprising value to our customers. Lumber Link, on the other hand, had a business model of quick, local procurement of timbers for timber packages and fabrication of rafter tails, corbels and other specialty lumber products. They were unable to provide the high quality mortise and tenon trusses and frames of Texas Timber Frames. 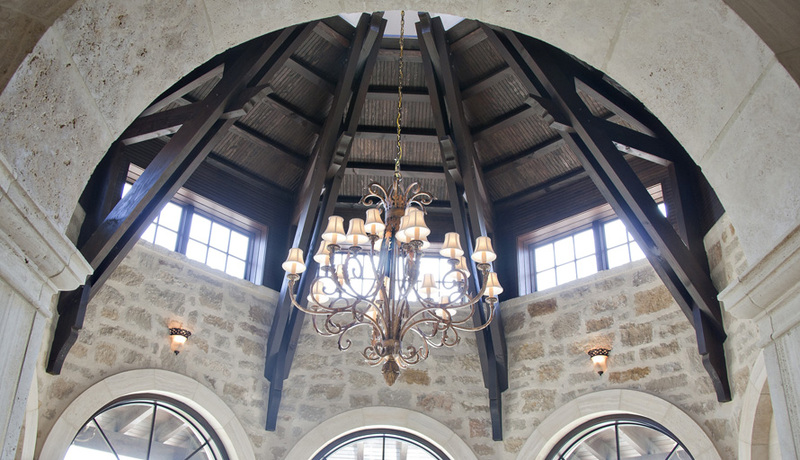 With an incredible reputation for service and follow through, Lumber Link built a vast network of custom builders and architects in San Antonio and the Hill Country who trusted them alone with their timber needs. In working together on a few projects, the leadership of both companies found that they shared the same core values: ensure customer service is at the forefront of your operation, reward your employees’ great work, and provide the best product at the greatest value. In bringing the two companies together in partnership, Lumber Link is able to offer a higher quality product to its customers and continue and build its reputation for excellence. Texas Timber Frames is able to wholesale truss fabrication and share its top-grade timber material with Lumber Link while building its reputation and scope of work. It is a great partnership that we are excited to see grow into new markets and ventures! Our featured project this week is the East Texas Car Barn, a 20,000 sq. ft. museum for a personal collection of classic cars and tractors. This project, which is private owner-driven (no pun intended) and designed by Texas Timber Frames, will be the largest timber frame structure in Texas and one of the largest in the nation. Utilizing almost 150,000 of beautiful, hand selected Douglas fir timbers from Oregon the structure features both a breathtaking, hand-crafted aesthetic as well as the strength to meet the 110 mph constant wind shear requirements of its location. The structure features traditional, mortise and tenon joinery at every timber connection and will be insulated by an unbroken envelope of SIPs (Structurally Insulated Panels) for the highest level of energy efficiency. As of today, we are completing the old-style barn raising of the final few bents and should be done with the frame erection in three weeks. We are proud to be a part of this project and look forward to seeing the completed structure! Football Season is Here See What One Fan Did! We recently had a prospective client come to us with the wonderful idea of a timber frame "party barn". She had found some photos on the internet of a beautiful structure in Montana that had been built with the idea of gatherings within a very rustic barn structure but with a living quarter quality interior. The structure was built with reclaimed oak timbers that gave the home a beautiful rustic and authentic feel. Often times these timbers are disassembled from an old barn, mill, or factory that was built last century and is now abandoned. The walls, roof, floors and finish out of the home may be rotting and decaying due to neglect, but the timber frame structure still has the original integrity and can be recycled. The use of reclaimed timbers and materials in a home has its costs and benefits. The benefit is that new trees need not be cut down because the timbers from other structures are being recycled. The energy expended from cutting and shipping and milling a log is great, and you loose a tree. However, with a recycled timber you really are only paying an "energy cost" for the shipping of the member. In addition, the timber over time develops a "patina" on the surface that is beautiful and unique. Often times, if the recycled member is from a structure passed down through the family, there can be a sentimental connection as well. The costs are really associated with the cost--a reclaimed timber can cost 3-4 times that of a similar sized "green" timber. The other issue is that it can be difficult to find specific sizes. In building a whole timber frame, you need consistent and exact sizes for the repeating members like posts and perlin and this can be a challenge. 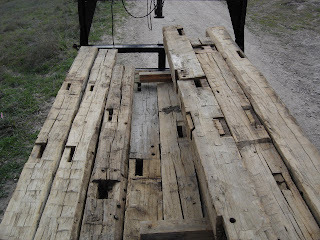 We at Texas Timber Frames are able to provide a compromise between green timbers and reclaimed. We can age and distress green timbers to give the look of an old beam. By using a hatchet or other tools we can create a hand-hewn look on the timber that will look as though it was cut a century ago. By using a lime-based formula that will pull the tanons out of the timber you can create a feaux patina that will emulate the look of reclaimed material. We can do all of this for half the price of reclaimed and give a very rustic, authentic look. Our prospective client is debating between the reclaimed material and the aged and distressed timbers and we are proud to be able to work with her whatever decision she and her husband make. I had a great opportunity last week to become certified to teach AIA accreditation classes about timber frame homes for the Timber Frame Business Council. The presentation was in North Carolina and taught by Jerry Rouleau, creator of Builder's Radio and homebuilding marketing guru. The opportunity to teach architects about what we do is very exciting to me. 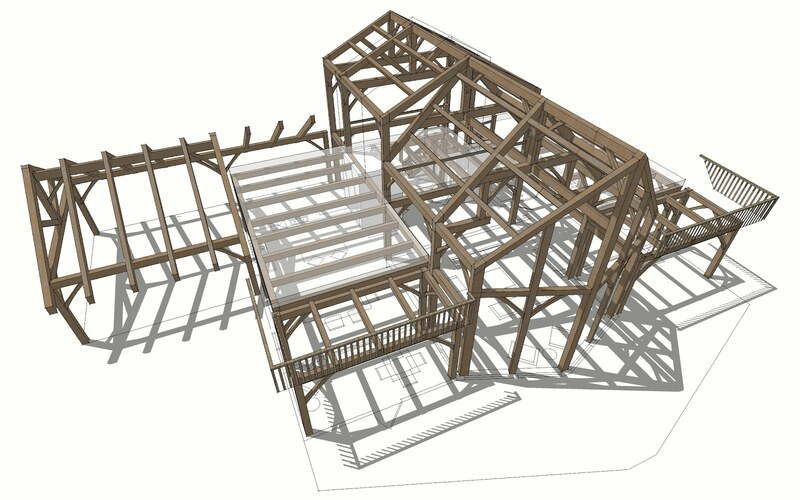 While many architects are familiar with timber framing, I've found that many are not aware of the many benefits of timber frame construction. As many architects around the country are turning towards green construction as not just a trendy meathod but the standard meathod of construction I look forward to the chance to share how timber frame construction is energy efficient, sustainable and utilizes all of the benefits of pre-fabrication. I also look forward to discussing the multiple applications of our construction meathod. While a full timber frame home is absolutely beautiful, there are times when a hybrid home (one that utilizes timber frame construction and other forms of construction in the same house) is more appropriate for the project. 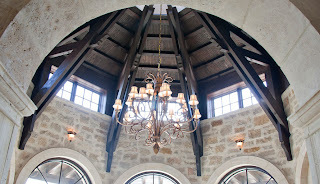 Also, using timber frame trusses in the home as cosmetic accents lend an air of rustic elegance to a home. Sharing the Texas Timber Frames passion for timber framing with those with a passion for designing homes will be a great opportunity that I look forward to.